Tribal court judges, state judge, prosecutors, practitioners, and national visitors attended the Indigenous Dispute Resolution Colloquium at the UNM Law School. Tribal judges, a state judge, prosecutors, practitioners and national visitors recently learned a new type of indigenous dispute resolution at the UNM Law School. The Circles of Peace Indigenous Dispute Resolution Colloquium, hosted by the Southwest Indian Law Clinic (SILC), is the first comprehensive colloquium of its kind to be sponsored by a law school. The colloquium demonstrated how attendees could develop Circles of Peace facilitation skills and how they could expand their services to include this form of indigenous dispute resolution. Law School Deans Alfred Mathewson and Sergio Pareja welcomed attendees and commented on the effectiveness of Circles of Peace. UNM Law School deans Alfred Mathewson (l) and Sergio Pareja welcomed attendees. Fairbanks describes Circles of Peace as using the core values of listening and respect to enable a shift from adversarial behaviors to those of wellness. Visiting Professor Cheryl Demmert Fairbanks led the Circles of Peace demonstration. Individuals take turns speaking while holding a basket or talking tool while others listen. The agenda included a demonstration of Circles of Peace, led by Fairbanks. Members of the circle use a talking tool, such as a hand-woven basket, and speak only while holding it; others listen. All get a chance to tell a story, discuss the issue and share their perspectives. With each story told, understanding and appreciation of each other grows. “That’s the beauty of Circles of Peace,” says Fairbanks. 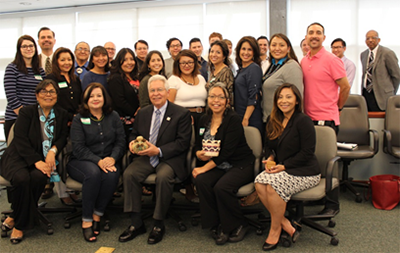 SILC has been using Circles of Peace recently to help Native clients in state, federal, and tribal courts and in governmental agency hearings (see news story) and SILC student attorneys have given numerous presentations on Circles of Peace to tribal courts (see news story). 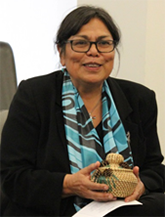 The National American Indian Court Judges Association (NAICJA), the Casey Foundation, the Native American Rights Fund (NARF) - Peace Making Program, Columbia School of Law and the Tribal- State Judicial Consortium partnered with SILC to present the colloquium. The Honorable John Romero of the Bernalillo County Children’s Court tells a humorous story while Chief Justice Emeritus Robert Yazzi looks on. 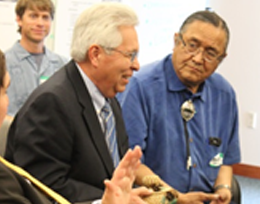 Chief Justice Emeritus Robert Yazzi, Navajo Nation, shared a story during the Circles of Peace. The Colloquium was coordinated by Visiting Professor Cheryl Demmert Fairbanks, who is directing SILC this semester, and April Wilkinson (’16).